This is for DC users only, --------- but this kind of wiring is still needed for DCC if you intend to go this way. 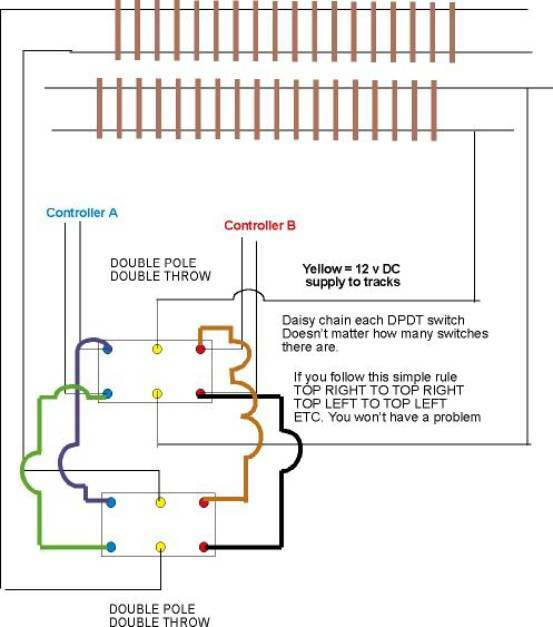 For DCC, although there are only 2 wires in use at the controller end, you will still have the need to wire (If using electro frogs) the layout as if you were going to use block control, (but without the need for DPDT toggle switches). When 2 facing turnouts come together, the need for isolation between these areas is a must otherwise a short will occur. Now because you have added wires to power up this area, and most likely other facing points (Turnouts) in other parts of the railroad, you will end up with many pairs of wires dangling underneath. All that remains to do now is to pick up all these wires (Lets say they were all Black and Red wires) and solder each Black wire together and the same for the Red and now you have 2 wires ready for DCC. 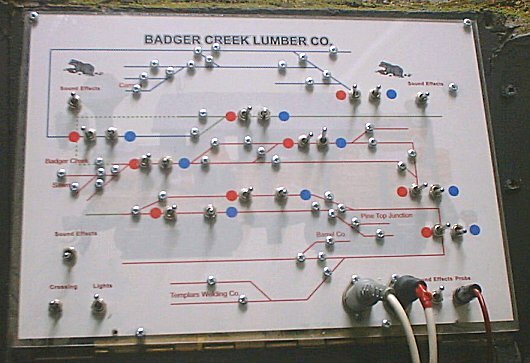 So for those how are about to start in the wonderful hobby of ours, here’s how I have always wired a model railroad up to a control panel. Once all your track and points (turnouts) are down and ready for wiring, first make a simple drawing of your Trackplan on an A4 sheet of paper. This Trackplan you draw will help in determining where to place each D.P.D.T. (Double Pole Double Throw centre off switch) Every place where you have back to back points, need to have a power supply, if you are using Electro frogs. Even if you are using standard insulfrogs, if you want proper block control, then I would suggest that you follow these instructions as for Electro frogs. By simply switching the D.P.D.T. from down to up, or up to down, any controller can be used with any part of the trackwork. This is the beauty of block control. Looking at the Trackplan you will notice that the outside tracks have three RED power supplies (3 blocks), and the inner tracks also have three RED power supplies (3 blocks.) with one single RED power supply in the middle feeding back the spur. 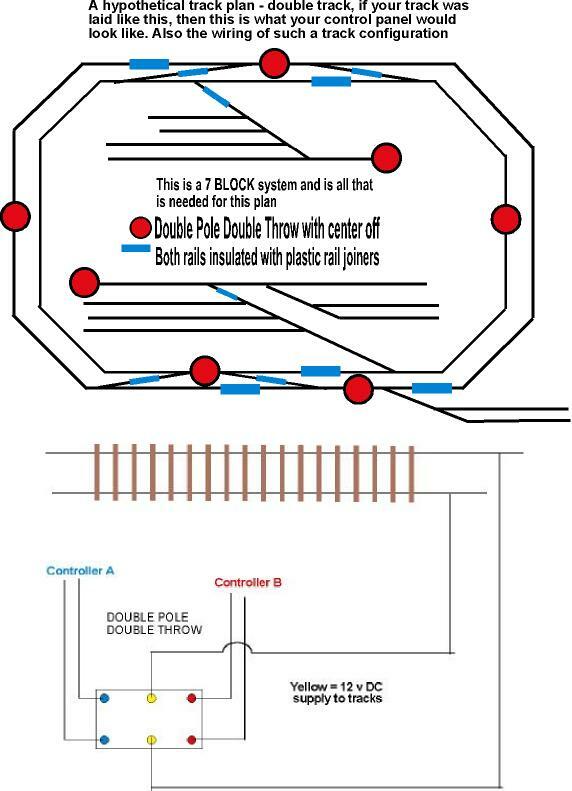 With this arrangement, it is possible to run two trains on the outer tracks from block to block, simply by switching the D.P.D.T as you go along, using the two controllers. The same applies to the inner tracks also. Another advantage of block control is that should you wish to travel around the outer tracks and then cross over into the inner tracks without stopping, all you need do is set each D.P.D.T switch to the up position. Now, when you wish to come out of the inner tracks back to the outer tracks, you can either leave the switches as they were and run out or switch the D.P.D.T.’s to the down position, and use the other controller. It’s as simple as that. Okay, now you know why you need D.P.D.T.’s for, lets set about showing you how to make a control panel and how to Daisy Chain the D.P.D.T switches. Once you have daisy chained the top rights of every switch, start TOP left to TOP left and so on until all switches have been daisy chained in this manner. Once all are daisy chained, you are ready to run trains. Now to reversing loops, and still using the D.P.D.T switches. The diagram below shows a simple straight piece of track representing the loop. You will notice that I have included the use of two controllers in this loop, should you wish to use either controller to reverse a loco. The reverse polarity switch is on the right, whilst the other D.P.D.T serves as switch to govern which controller you wish to use. Making the control panel it 'self, I use two pieces of Perspex the right size for my panel. Next thing to do is draw out the plan on a computer programme to A4 size. When finished I print one copy on plain paper and another on Photo paper at top quality to use as the finished product. When all drilling is completed, I remove the plain paper and clean up the two pieces of Perspex. Now I insert the new Photo Paper printout and I have a professional looking control panel just waiting to be wired up. 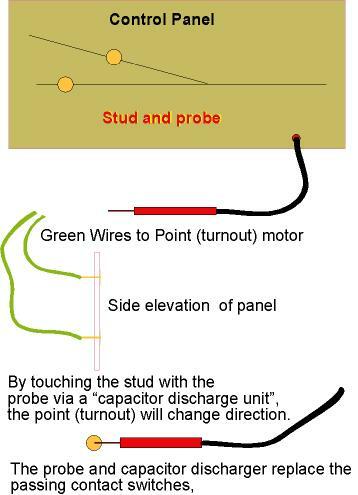 For my point control I use the stud and contact method utilizing a capacitor discharge unit (CPU), which has a 24volt output for my PL10 point motors which I use to throw the points. The reason I prefer stud and contact over momentary switches (To throw the points) is I only need two tiny nuts and bolts (Brass) fitted to each point on the control panel. Also because I use a CPU, if I did leave the probe pressing against the bolt, it wouldn't damage the point motor because the probe needs to be taken off before the CPU re-charges itself ready for work again. Here is what my control panel looks like, notice the nuts and bolts, these are my stud and probe contact for changing point direction. You will also notice that I have two switches per block, the reason, I could only buy D.P.D.T without centre off, so I had to put in beside the D.P.D.T. 's a separate on/off switch. Thanks for the terrific "How to"
A Most Excellent Tutorial Paul......................you sure your last name isnt mallory?? Great stuff Paul Thanks for posting. Paul, I believe this tutorial will solve a lot of problems in the future. I like the stud and probe idea for several reasons. First and most important it saves on a bit of wiring and labeling, pretty hard to go wrong there, point where you want to go and open the throttle. A very good presentation my friend. Well with DPDT switches, you can only ever run one train on one piece of track at the same time. 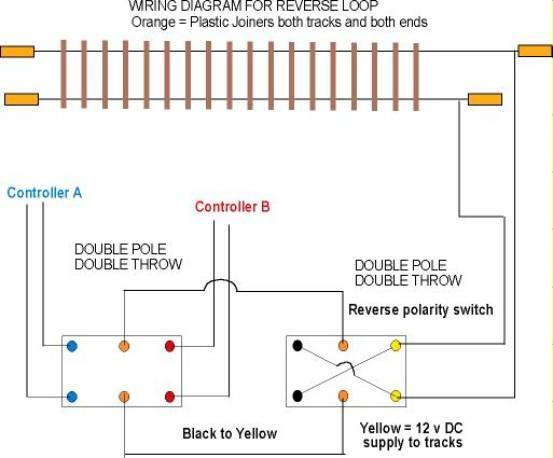 The double pole double throw switches are only for switching between one controller and another. Aso that probe system is cheap, just nuts and bolts plus a piece of wire with a bit of wire i=on the end.